Thread: GBS-8200 and a quick circuit for CGA / EGA? Anyway, instead of spending time splicing all the cables back on to the monitors and hoping for the best (these get the power from the monitor) I was thinking of getting a test setup working first with more modern hardware by wiring one of the power cables to an ATX power supply, and getting one of those cheap Gonbes GBS-8200/8220 boxes to get video out to a VGA monitor (I know they're not the best things, but for their price they seem acceptable). Reading into it, I have seen people use the "C128 DAC" to convert TTL CGA into analogue RGBS, and while they do accurately reproduce the video (including an accurate 'brown'), as one of these Amstrad XTs (one is a PC1512, the other a PC1640) apparently outputs EGA I was looking for a way to convert this as well. According to Wikipedia EGA doubles the number of colour lines so there is 6 in total (2 each). I was wondering, could a modification of the above circuit be made where the Intensity connection is replaced by a similar connection from each secondary R/G/B (or is it primary? I'm not quite sure which of the two would be the 'higher value' EDIT: missed that Wikipedia listed the secondaries as 'Intensity') to its respective primary one. Do you think this method would work? I was thinking of designing a small board that could do either CGA and EGA based on what you hook up (CGA Intensity vs EGA secondaries) and just bridging the R/G/B higher connections together so the Intensity triggers all 3 at once. Last edited by lameboyadvance; August 27th, 2016 at 10:12 PM. You could do the conversion using a resistor divider with 2 resistors on the high side (like a simplified resistor ladder DAC with only 2 bits input). However the GBS-8200 will not sync to 21.8KHz EGA. I know it's marketed as supporting EGA, but what they really mean is "medium resolution arcade video" at 25KHz. 21.8KHz is just outside the range supported by their conversion chip. I've experimented with modifying the registers of the conversion chip directly, but there's no way to get it to work at 21.8KHz--the chip is more or less fixed at just a few horizontal frequencies. Quite disappointing. I suppose you could get the EGA card to output the 200 line modes only (at 15.7KHz) which should work. You will still need the XOR gate to create the combined sync signal. The vertical sync input doesn't seem to do anything on the GBS-8200 in non-VGA modes. Thats disappointing. I was hoping when it said it did EGA, it was flexible enough in its allowable frequencies to actually do 'computer' EGA. I did find a custom firmware thread for the GBS-8200 over at Shmups, but it seems more to add additional video out modes, and a couple of times when people asked about supporting input frequencies outside 15/25/31KHz their posts generally went unanswered. ...Anyway, as the PC1640 does have DIP settings for plain CGA I can still use it for testing both machines. I was hoping to try out the full EGA mode though (the monitor it came with is only the monochrome model). I may still design a small PCB to sit inside one of those cheap plastic DB15HD/DB9 hoods, as a simple converter cable would still be of some use. Still deciding if I should attempt the full Commodore DAC version as well, as it would fix the brown/dark yellow issue (even if it would be more bulky). My hope is to get a VGA card in the 1640 in the long run anyway so its not really a dealbreaker if I don't get to see things in glorious 640x350x16. EDIT: ...Are there any similar video converter boards in the same price range as the GBS-8200? This is the only one I've seen (that did VGA out) that isn't over $100. Last edited by lameboyadvance; August 28th, 2016 at 04:47 PM. My experiments were based on info from that thread. I'm not aware of other boards in that price range. I wound up getting a really good deal on an NEC Multisync (the original) which, after a lot of cleanup, works fine for my purposes. On a side note, I have a Amstrad PC-CM CGA monitor from a 1512SD that I have been troubleshooting as of late. Would it be possible to test it with a standard IBM CGA card and a simple re-cabling job? I too have a PC-CM monitor (and a PC-MD for the 1640), sadly the cables have been sliced off both and will need work to reattach (hence me looking into alternatives to test the machines before doing so). I'm not sure if other machines like an IBM use CSync or have separate syncs. You'll have to make an sync adapter/combiner circuit if they do. Yes, they have separate syncs. Now on to figuring out how to turn them into a composite sync. 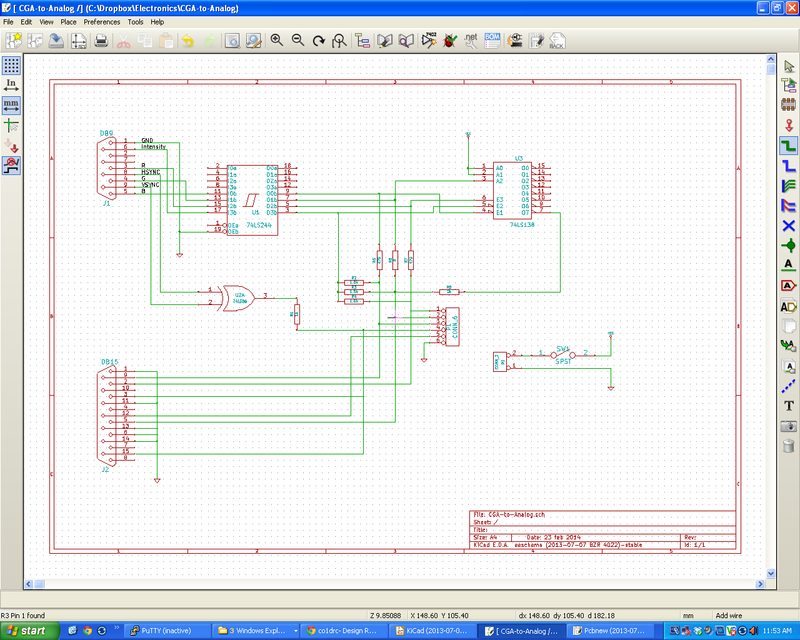 The circuit Tronix linked earlier just used an XOR gate (74LS86) and a resistor. A quick Google also turned up this one just using a diode and a resistor. However, the page it came from says "The only requirement is that both the horizontal and vertical sync signals must be negative". Thanks will get to this soon. It would be nice to find that at least one part of this system that works, given it's good cosmetic condition. I know that the FDD is dead, but would like to test the monitor and keyboard as well.